Move beyond the letter of the Word and into the substance of the Divine. "The process and the power! Applying the Word of God and the power of the Holy Spirit to set people free..."
Lifestream Ministries reaches out to, and ministers in the nation of Peru. Jesus said, "The works that I do you shall do also and greater works than these, because I go to the Father." To do the "greater works" requires a higher level of vision than what the natural person sees. What did Jesus, the Son of Man, see that enabled Him to do the works of God? Download "Absolute Dominion" absolutely FREE and catch a glimpse. 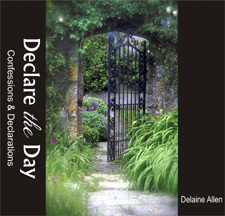 Delaine's transformational audio, "Declare the Day" contains rich and powerful scriptural declarations that you can proclaim daily over your own spirit, soul, and body and over your life. You'll be refreshed, energized and edified as you release the authority and anointing of the Word of God into your atmosphere. The confessions and declarations are backed by the beautiful, spontaneous and flowing piano of worship musician Melanie Toews..